> Numerous homes have been burnt out and others seriously affected in Ojén and Marbella. The urbanisation La Mairena has flames affecting several properties. 11:36 | Numerous homes have been burnt out and others seriously affected in Ojén and Marbella. The urbanisation La Mairena has flames affecting several properties. The situation is particularly difficult in the upper part of Calahonda where residents have been evacuated and there are flames in the urbanisation between Calle Cristóbal Colón and the residential complex Princess Park. Some 3,000 residents of El Rosario in Marbella have been evacuated, and German couple in their 60’s have been seriously hurt. Marbella Ayuntamiento says they were surprised by the flames and now have burns 40-50% of their bodies. Those affected by the blaze are being first treated in the Costa del Sol Hospital in Marbella, and then many suffering burns are being transferred to Málaga to the Specialist Burns Unit in the Carlos Haya Hospital. 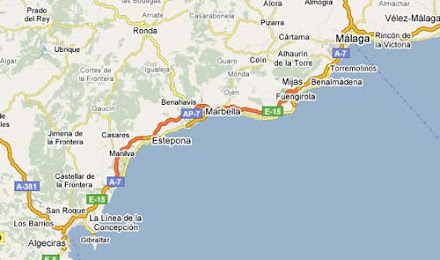 People have been sleeping in sports centre in Monda and Marbella and municipal buses have been laid on as transport. The Junta delegate in Málaga, José Luis Ruiz Espejo, has said today that he suspects the fire could have been started deliberately given its rapid propagation. He said the technicians suspected the fire was man made from the start. Ground fire fighters worked through the night facing difficult terrain and totalled 99 fire fighters distributed in seven brigades, and three reserve brigades, five fire engines, five operation technicians and four environmental vehicles. At first light this morning the 17 fire-fighting planes returned to the air. Five planes which drop earth, four large capacity helicopters, five transport helicopters, two amphibian planes, and a plane for coordination and vigilance. More than 250 professionals from fire fighting organisation INFOCA are working this morning in Mijas, Marbella, Alhauin de la Torre and in Coín where the fire started. The Mayor of Marbella, Ángeles Muñoz, has confirmed that several urbanisations have been evacuated, including La Mairena, Elviria, the area of Las Chapas and Molinillo where the fire is concentrated and continues to advance. Between 25 and 30 families have been evacuated from Alpujata on the outskirts of Monda. The fire broke out on Thursday afternoon and has affected Coín where some 60 homes have had to be evacuated. The fire was still burning overnight as so the terrestrial fire fighters continued to work over night, according to the fire fighting Infoca. The extinction of the blaze is being complicated by the strong hot wind known locally as the ‘Terral’. Three of the four fronts were brought under control just after midnight. 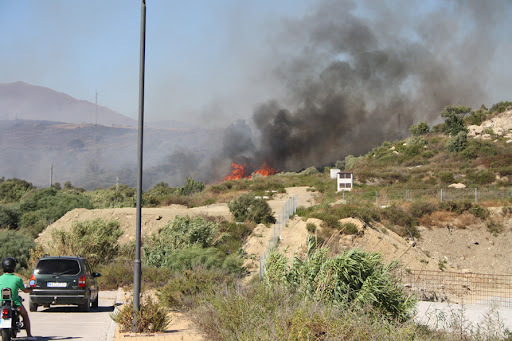 The fire is also affecting Alhaurín El Grande and Mijas where homes have been evacuated in the Entrerrios area, according to the Junta de Andalucía. The Barranco Blanco urbanisation in Coín is close to the fire, and there were fears that non-forestry zones could be affected. The Hotel La Cala Resort has also been evacuated of its 200 guests. Those evacuated have been told to go to the sports centre in La Cala, the sports centre in Las Lagunas or the Mijas Hippodrome. 13 airborne fire fighting planes were brought in on Thursday afternoon from Málaga, Córdoba and Granada, and they resumed their work at first light this morning. The fire continues out of control and the Mijas Town Hall has told the residents of la Atalaya to urgently leave their homes. A level 1 has been put in place and that indicates that the prevision for the fire could affect non-forestry assets. Wow, that's what I was exploring for, what a information! present here at this webpage, thanks admin of this web site. Magnificent goods from you, man. I've understand your stuff previous to and you're just too excellent. I actually like what you've acquired here, really like what you are stating and the way in which you say it. You make it entertaining and you still care for to keep it smart. I can't wait to read much more from you.